Skydiving seems like a new sport, but it's actually been around for a while. 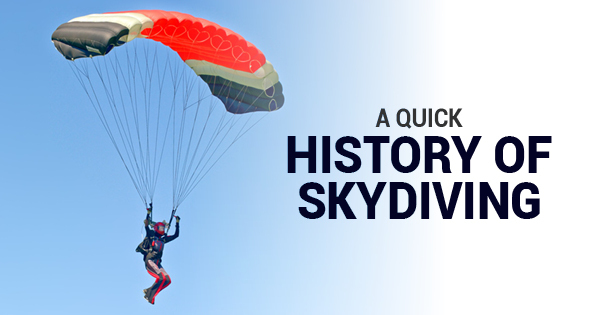 If you've ever wanted to know about skydiving's riveting history, here is a brief synopsis. DaVinci or China: Who takes the cake? Leonardo DaVinci actually sketched the blueprints for the first parachute in 1485 but the first recorded idea for a parachute was supposedly made from an old Chinese story. Sima Qian, a historian from 86 BC, wrote about the history of China, including the tale of an emperor who needed to make a quick escape. In order to survive a jump from a burning building, the emperor crafted a makeshift parachute. Between the story of the emperor and DaVinci, a few stories included the use of hats and umbrellas as a type of parachute. However, the design for a parachute was never nailed down before DaVinci got his hands on it. The first person to ever go parachuting was actually the inventor of the parachute: André-Jacques Garnerin. This French inventor and balloonist was the first person to successfully jump with a frameless parachute attached to a gondola in 1797 in Paris after the contraption was lifted into the sky via a hot air balloon. His parachute looked nothing like it does today, but the French inventor completed the jump without injury. The first parachutes usually featured frames, meaning the design was completely inflexible. This meant that the design was blocky, big, and unrealistic by today's standards. By the 1920s, frameless parachutes had caught on, making it them both safer and simpler to use. For obvious reasons, parachutes became increasingly popular for war efforts, especially in World War I and World War II. However, once the war was all said and done, soldiers continued to jump out of planes for the sheer enjoyment of flight. Parachutes are still a necessity in any aviation setting, but their recreational use caught on to create the adventure we know today. Even inexperienced jumpers can witness the exhilaration of flight through tandem skydiving at your local skydiving center. After a brief lesson in safety, the first time jumper is attached to the front of the experienced jumper to perform the tandem jump. The freefall is quick, only lasting a minute or so before the parachute is deployed. Then the tandem skydivers float gently to the ground. If you're interested in tandem skydiving, call Jump Florida Skydiving today. Tandem skydiving is a safe, fun adventure that any adult can enjoy. Visit jumpfloridaskydiving.com for more information on tandem skydiving today.